The Model 2900 Humidity Generation System is a self-contained system capable of producing atmospheres of known humidity using the fundamental “two-pressure” principle. 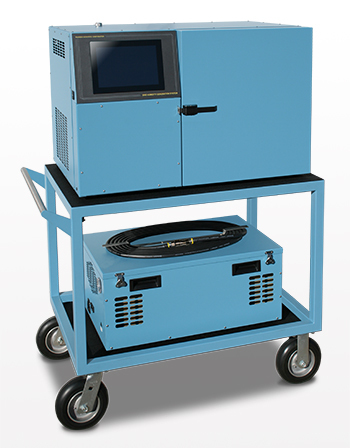 This system is capable of continuously supplying relative humidity, dew point, frost point, parts per million, or other calculated values for instrument calibration and evaluation as well as for precision environmental testing. This system will automatically generate manually entered humidity and temperature set points as well as user created multipoint profiles. All desired humidity’s, temperatures, flow rates, and time intervals may be programmed. The “two-pressure” humidity generation process involves saturating air or nitrogen with water vapor at a known temperature and pressure. The saturated high-pressure air flows from the saturator, through a pressure reducing valve, where the air is isothermally reduced to test pressure at test temperature. Humidity generation is dependent on the measurement of temperature and pressure, not on the amount of water vapor measured in the air. System uncertainty is determined by the temperature and pressure uncertainties, and on the stability and uniformity of the measurements. When setpoint equilibration has been reached, the indication of saturation temperature, saturation pressure, test temperature, and test pressure, are used in the determination of all hygrometric parameters. Elemental Schematic of the 2900 generator. The 2900 Humidity Generation System encompasses a high-performance stand-alone Control System that performs all functions required for humidity generation and control. The Control System employs 24 bit I/O modules with integrated signal conditioning to acquire data and uses serial interfaces to transducers and stepper motors to control the operation of generating humidity. The Control System utilizes an embedded operating system in conjunction with specialty software to control and interface with the human to machine interface (HMI) computer that runs ControLog. ControLog is an embedded software application that fully automates the operation of the 2900 Humidity Generation System and allows various device connections through a number of different interfaces. ControLog uses Thunder Scientific’s HumiCalc with Uncertainty as its mathematical engine for computing all humidity values and real-time uncertainties. Data from the generator and attached devices is automatically retrieved and stored for viewing in either numerical or graphical format in real time or post process. Data can be transferred off the system via a USB drive for further viewing, post processing and printing using an external Windows PC. The ControLog software also provides the primary interface to the operator via the multi-point touch LCD which allows the user to select humidity parameters, pressure, temperature, and flow units. The Parameter Tab is the primary interface for the user and is divided in two sections, Control and Calculated Humidity. Within each tab there are two different tiles, the Setpoint Tile is for the user to enter the desired setpoints and a Value Tile displays the Actual Value. Mouse over image for zoom area. Temperature Control: The 2900 humidity generation system incorporates a water/glycol jacked test chamber for extremely stable temperature control. Chamber temperature from -10 °C to 72 °C is controlled using PID (proportional-integral-derivative) algorithms to control the temperature of the water/glycol that jackets the test chamber and associated components. The water/glycol is circulated at the rate of approximately 14 gallons per minute by a magnetically coupled centrifugal pump providing the temperature conditioning of these components, resulting in excellent stability and uniformity for stable humidity generation. Pressure And Flow Control: Pressure control and mass flow control are accomplished through computer actuation of electromechanical valve assemblies. Saturation pressure and mass flow are measured continuously and controlled using PID algorithms similar to those employed in temperature control. Calibration: Proper calibration of the temperature and pressure transducers ultimately determines the accuracy of the generator. 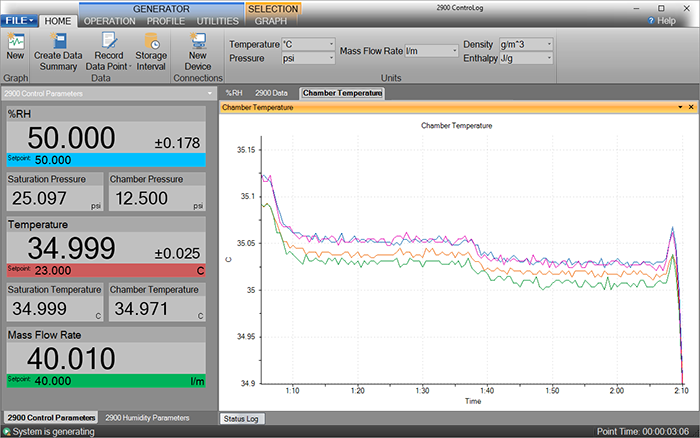 The humidity generator employs an integrated software calibration scheme allowing the 2900’s probes and transducers to be calibrated while they are electrically connected to the humidity generator. Coefficients for each transducer are calculated by the computer and stored to memory. The 2900 humidity generating system incorporates a test chamber, with internal dimensions of 12" x 12" x 10". Test chamber pressure range is ambient. Access is available through two 1.88" diameter ports located on the right side. An externally driven, variable speed, chamber fan is incorporated into the rear wall of the test chamber to reduce thermal gradients. 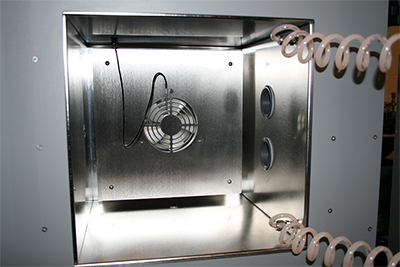 The test chamber accommodates various solid-state sensors, sensing systems, chilled mirror hygrometers, as well as material samples for environmental testing. Virtually any humidity and temperature may be generated within the operational limits of the generator. The output or recording of the device under test may then be compared with the generator’s data for analysis. Humidity Sensors and Chart Recorders: Insert humidity probes through a test port in the chamber or install the sensing systems into the chamber to: determine humidity calibration accuracy and/or characterize humidity sensitivity by subjecting the humidity sensor to a variety of humidity levels; perform operational checks such as the sensing systems capability to correctly calculate and display other humidity parameters; determine the repeatability, stability, hysteresis, and drift characteristics of various humidity sensing systems. Chilled Mirror Hygrometers: Install the actual chilled mirror head into the chamber or insert a sample tube through the test port and draw a sample through the chilled mirror head to: verify mirror temperature measurement calibration when the hygrometer is in thermal equilibrium with its environment; perform operational checks of the heat pump and optical components before and after mirror cleaning and balancing; determine whether the hygrometer is controlling the mirror deposit in the liquid phase or ice phase when operating at dew and frost points below 0 °C; determine if the hygrometer is correctly calculating other humidity parameters; determine hygrometer’s repeatability, stability, and drift characteristics. Humidity Sensors And Chart Recorders: Insert your humidity probes through a test port in the chamber or install the hygrothermograph into the chamber and you can: determine humidity calibration accuracy and/or characterize humidity sensitivity by subjecting the humidity sensor to a variety of humidity levels; perform operational checks such as the sensing systems capability to correctly calculate and display other humidity parameters; determine the repeatability, stability, hysteresis, and drift characteristics of various humidity sensing systems. Environmental Testing: The 2900 can serve as a test bed for evaluation and R&D of humidity sensors, humidity sensing systems, and humidity sensitive products, e.g., polymers, composites, film, magnetic medium, pharmaceuticals, soil hydrology, consumables, electronics, optics, etc. 1 Traceable to the International System of Units (SI) through NIST-maintained standards. 2 The system will limit mass flow rate to 30 L/min for %RH greater than 90 when the temperature is 50 °C or higher. 3 The system will limit mass flow rate to 20 L/min for %RH greater than 95. 4 Using glycol/water as the temperature heat transfer fluid from –10 to 72 °C. Note: the 2900 can only operate for a finite amount of time at or below 0 °C. 5 Temperature Control Stability is defined as the standard deviation over a 10-minute period, as measured by the saturation temperature control sensor after being at point for 60 minutes. 6 Chamber Temperature Uniformity is defined as the maximum temperature difference between any two locations at a single point in time. Locations are within one inch of the chamber wall and within 2.5 inches of the chamber door. Using a minimum chamber fan speed of 25% for a temperature range of –10 °C to 72 °C when using fluid jacket door option and ±10 °C from ambient when not. 7 Chamber pressure at 1 atmosphere. Uncertainty values represent an expanded uncertainty using a coverage factor, k=2, at an approximate level of confidence of 95%. Uncertainty is not specified at temperatures below 0 °C or at flow rates below 10 L/min. Uncertainty is based on the worst-case value from the 2900 uncertainty analysis. The option available for the 2900 is the Window Chamber Door Assembly (WDA).